Today I want to explore further why our Bridegroom lover choses to says to us ’You are my dove’ and say it so many times in the Song of Songs. Why such a choice of bird? What is He trying to convey? 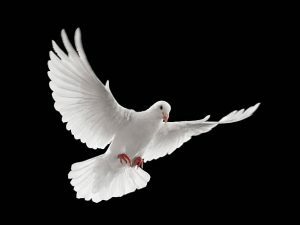 The dove is a very beautiful and innocent bird, and no other bird is mentioned more frequently in the Bible. It does not live upon the flesh of other birds or creatures: so when Noah sent one out of the ark, she soon came back again, because she could find nothing to eat. She would not devour another creature even shying away from their dead remains. A dove does not prey on others. Rather she is sensitive to others and avoids confrontation and decries exploitation. A lover of peace and has a gentle spirit. So Noah put out his hand and gently took her back in, and she did not go out again for a whole week. Then Noah let her fly, and the beautiful creature came back in the evening, having in her mouth a green leaf which she had plucked from an olive-tree; as though she wanted to tell him that the waters were beginning to dry up. The storm was over. The earth was at peace. And so today a dove with an olive leave in its mouth represents peace. The dove remains until the summer is gone; and then she flies away to a warmer climate to spend the winter. Yes the dove is a bird of passage …a bird on a journey and every journey must have a destination in order to be meaningful. If He calls us my dove what journey are we on and what is our destination? Some would say our destination is heaven. But scripture tells us that it is here on planet earth when, after the Rapture and the Wedding of the Lamb, we return with our Bridegroom King to reign with Him for the thousand year …… when the “Kingdoms of this earth will become the Kingdoms of our God and His Christ”. Rev 11 v 15. Then after the New Earth and the New Heaven are created we live again on earth and God dwells with man. All this is so wonderfully true of course but there is another destination for the Bride which is not about place but about position. Not about where we are but about who we are. The Bride is on a journey just like the dove is when the season is right. The season is now; the invitation to “Arise my love” has come. It is a journey of self-discovery. Song of Songs describes it so beautifully. It a journey of discovering who she really is and of discovering who’s she really is. It’s the journey towards identity and Intimacy. There are just three verses in the Song of Songs that map out so clearly the progress of that journey. The first realisation of her relationship with her Lord is so self-centred. Not only had He done everything for her, but the future was promising and she was going to……. save the world for Him. He was MY Lord and MY saviour as MY provider. The zeal and enthusiasm of this new born Christian is wonderful but her love is so shallow and fickle. She has not been tested and refined. The …”and I am His”… is almost an after thought? There is now a recognition that she belongs to Him. Notice that she is no longer obsessed with Him being hers but that she is His. This is real progress. She moving along the journey towards her destination……intimacy. Now she knows who she is. Her significance is in Him alone. She is His glory as Eve was for Adam. Her beauty is merely a reflection of His Beauty. She truly owes everything to Him and She is His possession. Her desire is to please Him and His desire has become her pre occupation. Destination arrived at? No….not really. The real journey has just begun. Howard Barnes was born in England in 1944 to Salvation Army pastor parents. After secondary education he went to university and studied Theology and subsequently become a Secondary School teacher and served in several London schools as the Head of Divinity. During these years he also was a youth leader and then served as a pastor of a local church in Cornwall, England. In 2003 he retired from teaching, after 37 years’ service, to take up a position as director of an evangelistic ministry called Harvest for Christ but in 2008 he became Co-director of Time Out Mission International and more recently director of The Body and the Bride Network Ministry International (UK). These last two ministries which he co-directed with his close friend and ministry colleague, Michael Pike (Apostle), were deeply passionate about two things. 1) to see the worldwide Church discover the meaning of real unity and so fulfill the prayer of Jesus in Jn 17 v 21 and 23 ….“that they may be One even as we are One” and 2) to understand and embrace its end-time identity as the precious Bride of Christ and to prepare her for the coming Bridegroom King. These experiences have paved the way for the creation of this new ministry called The Call2Come which, while still holding to these emphasis, calls the Church to prepare Herself as His precious Bride and so position Herself to cry the prayer that only the Bride can¬ pray. It is only the “Spirit and the Bride” that can cry Come. Howard has received two honorary doctorates in recognition of his mission and reconciliation/peace work in over 70 nations around the world. He is also an official representative for Foundations for Biblical Farming (FFF) which comes out of Zimbabwe, Africa and for the World Prayer Assembly (WPA). He is a regular speaker at international church conferences and operates under an apostolic mantel. He has been married to Tricia for 50 years who was herself a music teacher, and they have two lovely married children and four beautiful grandchildren. He is both a musician and a gifted artist. Please tell me! How do we make ourselves ready for our Bridegrooms coming? One Touch from the King or a Lifetime of Intimacy? Why settle for less?